Michael “Doido” Yorke was born in North Vancouver, B.C. 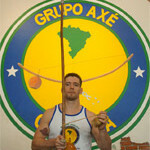 Canada and began training Capoeira in 2000 with Mestre Barrão. He first saw Axé Capoeira on Much Music, a Canadian music television show, and was instantly drawn to Capoeira. He noticed the academy was in Vancouver but was unable to get the address before the show ended. Luckily, Axé Capoeira came to his high school the following week. Doido quickly asked for information on classes and began training the next week. Curious as to the philosophy, rituals, and stories hidden within the songs of Capoeira, Doido studied Portuguese intensely and became fluent. He considers this to be his biggest asset for growth in Capoeira and enjoys being able to speak and learn from Mestres, and Professors that visit Vancouver or he meets abroad. Doido has traveled extensively throughout North America and Brazil attending events, batizados, shows and performances. Doido means crazy. He received this nickname for his fearlessness towards falling while training acrobatics. He learned very early from Capoeira; as in life, it doesn’t matter if you fall, but how quickly you get up. Training with Mestre Barrão until 2006 when Mestre returned to Brazil, he now trains with Contra-Mestre Barrãozinho at the Axé Capoeira Headquarters in Vancouver, Canada. Since 2010 Graduado Doido has taught children’s classes at Seymour Dance Academy, in North Vancouver, Canada. And, as of January 2015 teaches students at the British Columbia Institute of Technology (BCIT) .